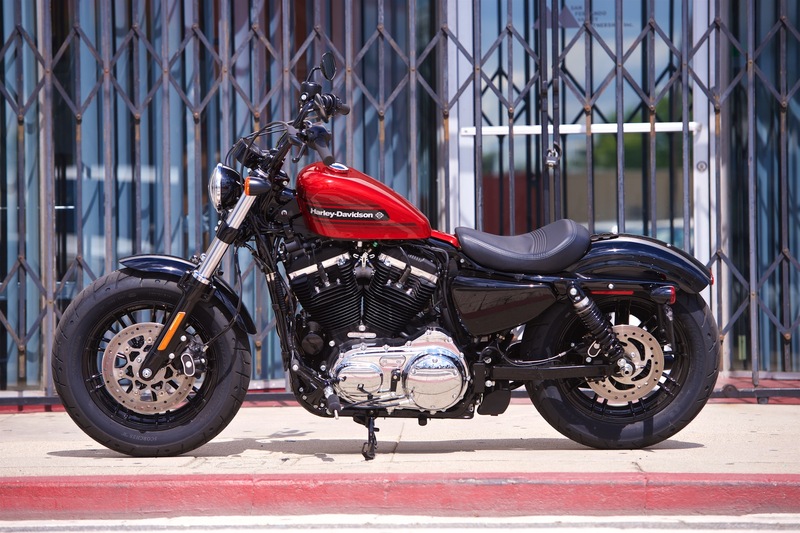 On course to release 100 new models by 2027, the latest addition to the Harley-Davidson family is a Sportster—the 2018 Harley-Davidson Forty-Eight Special. As expected, it is based on the standard Forty-Eight, with a few twists that intrigued us to hop right on this variation of a popular Sportster model. 1. Functionally, the only difference between the standard Forty-Eight and the 2018 Harley-Davidson Forty-Eight Special are the Tallboy handlebars. 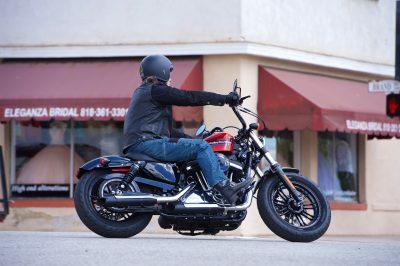 Rather than the low and flat bars on the standard, the Forty-Eight Special gets handlebars with a 7.25-inch rise, though with less pullback than Harley-Davidson’s Mini-Ape bars. This changes the Forty-Eight from a café style motorcycle with forward foot controls, to more of a fists-in-the-wind custom. 2. The Tallboy bars completely change the ergonomics of the Forty-Eight. Instead of putting your body into an awkward jackknife position—which has a cool look, but isn’t particularly practical or comfortable—your feet are forward and your upper body is upright. The air cleaner assembly is definitely more noticeable, so a bit of man spreading is in order. 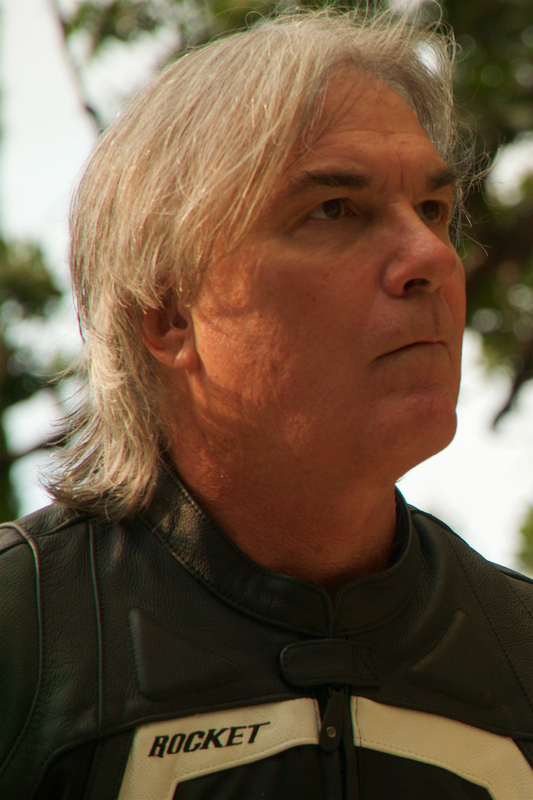 The result is a motorcycle that you can ride from a full-tank to the low-fuel light coming on with no problem. 3. While Tallboy handlebars might not have a sporting reputation, they work great on the 2018 Harley-Davidson Forty-Eight Special. The Tallboy bars have good leverage, and work perfectly with the beefy 49mm fork and fat 130mm Michelin Scorcher 31. The chunky 16-inch tires provide a reassuring footprint, even on days when Mulholland Drive is wet and dirty after a rainstorm. The Forty-Eight Special is a fun ride in the twisties, though you will always be reminded that cornering clearance is limited. Fortunately, grinding the peg feelers into the pavement isn’t especially startling, as it is a fairly regular occurrence. 4. The Evolution 1200 motor does its job admirably. With 73 ft/lbs at just 3500 rpm pushing a 564-pound cruiser, acceleration is good. You can quickly sprint away from city traffic when the light turns green, and pull strongly out of corners. It is not the fastest revving engine, so your acceleration is limited more by its willingness to rev than its power. That means you get predictable and controllable power, so you can make the most of the Forty-Eight Special’s chassis. With rubber mounting, vibration isn’t a problem. The 45-degree V-twin throbs nicely at stops, and smooths out once underway. 5. With the different ergonomics, the brakes feel different. Your body angle at the brake lever and pedal change with the Tallboy bars, and the brakes don’t have quite the same stopping power. The rear brake feels a bit less aggressive, while you’re not going to be quite as hard on the front disc as you would on a bike with lower handlebars. The reality of it is that engine compression braking does most of the work, and the brakes typically get used sparingly. If you get caught out and need to brake hard, you might be happy you sprung for the $795 ABS option. 6. The solo saddle looks good, and is comfortable enough. Again, the handlebars have an impact on how your rear end interacts with the seat. In the case of the 2018 Harley-Davidson Forty-Eight Special, the seat feels good when sitting upright. It’s a minimalist seat, yet the back of it is a nice backstop for your keister. With the 2.1-gallon peanut tank full, it only takes about 60 miles to see the low-fuel light come on, and you can easily put that many urban miles on the Forty-Eight Special without your nether regions complaining. 7. The suspension combo of shocks, fork, tires, and seat do well for the rider. The forks are a cartridge design, and make the most of the limited travel, as do the emulsion shocks. The high profile tires do their job of taking the edge off the sharper potholes around town. The seat is fairly thin, as Harley-Davidson wanted to keep the seat height below 28 inches. As a rider, you are isolated from most jolts, though once in a while hard ones do get through. 8. Without any doubt, the Forty-Eight Special is an outstanding urban motorcycle. Maneuverability is good, and you can slip through traffic confidently. The Tallboy bars avoid most automobile mirrors; the Special’s mirrors are small and have a short stalk, yet still allow a good view. Although the Forty-Eight Special is happy at extra-legal speeds on smooth highways, the chassis gets overwhelmed over 65 mph or so on hammered freeways in-town. Below that, on the 55 mph freeways, it is a fine ride. 9. Chrome is more prevalent on the 2018 Harley-Davidson Forty-Eight Special than on the standard version. It’s all about taste, and the Forty-Eight Special will appeal to those who like plenty of the shiny stuff with their black. 10. It may be a Forty-Eight Special, but the graphic treatment on the gas tank is pure AMF-era. Not many people who were there look fondly back at the 1970s AMF days. However, there’s an aesthetic there that has undergone re-evaluation. The Forty-Eight Special invokes the 1970s in the way the Seventy-Two did, but based on a bobber platform, rather than from a chopper perspective. 11. The 2018 Harley-Davidson Forty-Eight Special is a more enjoyable and functional ride than the standard version. The Tallboy bars take a profiler and turn it into a rider. Undoubtedly, many riders will prefer the standard version’s stylish riding position. For me, it is all about the ride and the 2018 Harley-Davidson Forty-Eight Special is the way to enjoy nostalgia with comfort and style.